I’ve always loved the concept of Mtv unplugged. It really gives a band or artist a chance to strip down their music and bring it back to the basics. Some of my favorite Unplugged Performances include Nirvana, Pearl Jam, Dashboard Confessional, Alanis Morisette, and Hole. Mtv Unplugged really gives a chance for the bands to be creative and reinvent their songs. 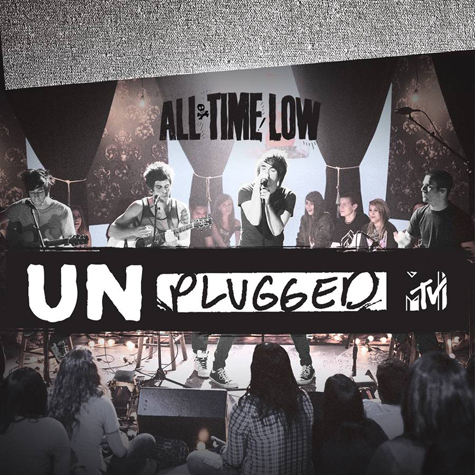 When All Time Low decided to release their MTV Unplugged Album with a DVD I was really excited. I love pop punk and I have always enjoyed acoustic renditions of most Pop Punk songs. It starts off with the track “Damned If I Do (Damned if I don’t).” The voices ring out so fresh and the guitars sound splendid right away. It’s a new song and begins with a tribal hand drum sound that right away kicks into the classic All Time Low sound. I love it. The 2nd track “Coffee Shop Soundtrack” draws me in with the sound of the guitars. The production is excellent and every time I listen I notice something different. The vocals really carry this song. I love the idea of bands taking it unplugged because I think it makes me pay more attention to the lyrics. Right after this song with true honesty the singer of All Time Low admits his nervousness. Mtv Unplugged Banter is always funny. Anyone remember Nirvana Unplugged? Kate Vogele’s voice sounds so soothing and relaxing on “Remembering Sunday.” So many bands see Mtv Unplugged as a great place to bring in Guest Musicians to sing with them. On Weightless the tempo picks up and it seems the band is finally comfortable in this environment. The added crowd vocals and clapping give a fresh sound to this track. It gives me a feeling that I am right there sitting in the front row during the performance. This isalso the first song that I feel the crowd really gets into. My favorite track is “Maria Count me In.” It’s one of my favorite All Time Low tracks and I was glad the band decided to play it. The crowd once again gets the clapping going. Overall I am disappointed because I was really hoping the band would have full drums, bass, and guitars filling their unplugged performance. The hand drums are not my favorite but definitely a different sound for Pop Punk. This CD/DVD is great for any Pop Punk fanatic. For All time Low its a great CD to kick off 2010.